This photo was taken at St Patrick RC Church in Bay Shore, New York. The bride had just gotten out of her limousine and was ushered to the rear of the church. In just a few short minutes she would take her father’s arm to be escorted up the aisle where her groom would see her in her wedding dress for the first time. 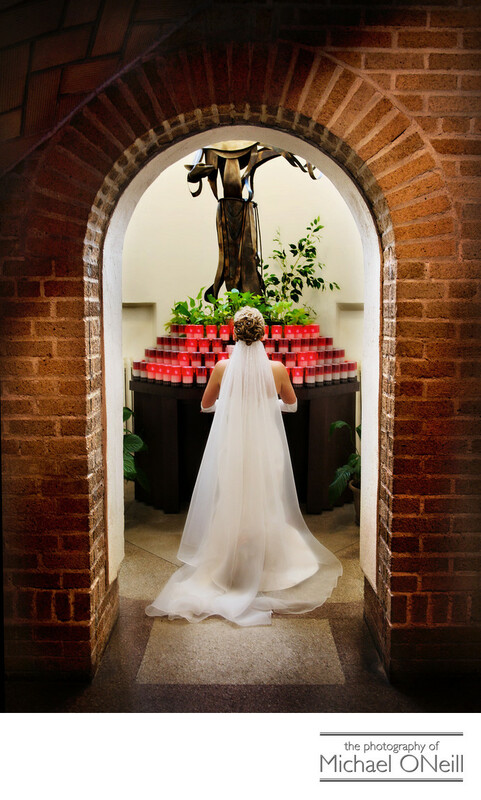 I spotted this small vestibule at the rear of the church and had the bride kneel before the votive candles and look up towards the religious statue in front of her. My assistant quickly adjusted her gown to flow elegantly behind her. The light from an overhead window in the vestibule was gorgeous and illuminated the bride perfectly. This wedding was one of the events that I often fondly recall. There are other pictures from this event on this web site...one from the preparations at the bride’s beautiful waterfront home and another from their amazing wedding reception at Carlyle on the Green at Bethpage State Park.